On Saturday afternoon, the NCAA tournament selection committee released its bracket preview. Just two days later, major changes are already underway. One of the most important parts of the NCAA selection committee’s midseason reveal came right at the end of the show. When asked how long the composition of the top 16 presented on Saturday would hold, committee chair and Michigan State athletic director Mark Hollis crumbled up the piece of paper in his hand and said it could be different by time that day’s action ended. Indeed, the top-16 teams unveiled to the country on Saturday are not the same as the top 16 in this week’s Bracket Watch. We may have peaked behind the curtain for the first time ever, but the landscape of the college basketball world is always shifting until that Sunday in March when it finally rests and the Madness begins. SMU, the East’s No. 6 seed, enjoyed a watershed moment over the weekend by knocking off Cincinnati at home to draw even with the Bearcats in the loss column in the AAC. The Mustangs are likely to win out in the regular season, and will be favored in every game they play before the NCAA tournament, unless they get a rubber match with Cincinnati in the AAC tournament championship. Assuming they do not lose to a team other than the Bearcats before Selection Sunday, they’re going to present the Selection Committee with an interesting seeding case. The Mustangs are 22–4 overall and 12–1 in the AAC. If they do indeed win out in the regular season, they’ll head into the AAC tournament with 26 wins and a 17–1 conference record. Numbers that gaudy are impossible to ignore, especially when they’re tied to a kenpom.com ranking of 13, and an RPI ranking of 26. No matter what happens the rest of the way, the Mustangs are going to command respect from the committee. And yet, the level of respect is still to be determined. While SMU is 8–4 against the RPI top 100, with zero losses outside the top 75, it is just 2–2 against the RPI top 50. We learned from the unveiling of the committee’s top-16 teams over the weekend that it prizes RPI top-50 record. SMU’s is fine, but unimpressive. What’s more, unless Houston can make significant RPI gains the rest of the season—the Cougars are 56th in the RPI—SMU will not play another top-50 team before Selection Sunday, unless it meets Cincinnati in the AAC tournament. In other words, SMU’s résumé is potentially as strong as it is going to get. The Mustangs climbed a spot in this week’s Bracket Watch, but the 6-line likely represents their ceiling. Wisconsin suffered twin blows over the weekend. On Saturday, the Badgers learned they were not one of the committee’s top-16 teams with a month to go before the field of 68 is set in stone. On Sunday, they suffered their most unlikely loss of the season, a 66–59 reversal against Northwestern at home. Both events exposed the weaknesses that could hold them back in March. Before losing to Northwestern over the weekend, the Badgers had handled their business all season. They did not lose a game in which they were favored, and all three of their previous losses were to teams safely locked into the field of 68. At the same time, however, it was a bit disconcerting that their losses came to Creighton, North Carolina and Purdue, the three best teams they’ve seen this year. If Wisconsin’s résumé had an obvious flaw, it was the lack of a signature win. Sunday’s loss to Northwestern further impugned its ability to get one before Selection Sunday. What’s more, the Wildcats may have exposed a fatal flaw. Ethan Happ has been a matchup nightmare for Big Ten teams all season, earning his way into the National Player of the Year conversation. Northwestern, however, neutralized him by bringing a double team from the opposite block or top of the key every time he touched the ball. The tactic completely stymied Wisconsin’s offense and was so effective that Greg Gard kept Happ on the bench for most of the final 10 minutes of the game. The result was Wisconsin’s first loss at the Kohl Center since early January of last year. Northwestern didn’t just pick up its best win of the season on Sunday. It also provided a potential blueprint for slowing down Wisconsin to the rest of the country. If that’s the case, the Badgers’ tournament ceiling is a whole lot lower than it seemed just one week ago. If any team in the country needed a good week, it was Notre Dame. The Irish were safely trending toward an at-large invite, but had lost four straight games to tournament-quality competition. They may have been in good position, but still needed to show the committee what they were capable of at their best. Consider last week, then, Notre Dame’s best of the season. The Irish started the week by handling Wake Forest at home. The Demon Deacons are 31st in the RPI, giving Notre Dame its second-best win of the season to date by that important metric. It would hold that status for just four days, however. The Irish turned it up over the weekend, getting out to an early lead over Florida State and never looking back, ultimately walking away with an 84–72 victory. The Irish started last week 3–6 against the RPI top 50. They ended it 5–6 against the same class, with two wins against top-10 RPI teams. 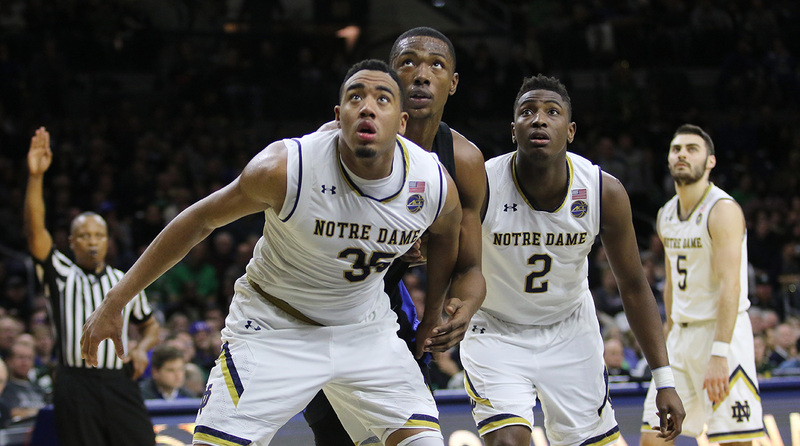 Notre Dame wasn’t in any trouble of missing the Dance, but now it can dream much bigger. With just one game remaining against a top-50 RPI team, the Irish could easily end the regular season with 22 total wins, including 12 in the best conference in the country. If they have a strong showing the ACC tournament, they could play their way into the top quarter of the field of 68, setting themselves up for a softer draw than was possible before they took down Wake Forest and Florida State. We went into the weekend hesitant to change anything revealed by the selection committee, but understanding of the fact that everything we learned was written in pencil. There is still a month to go until Selection Sunday, and Mark Hollis, chair of the selection committee, said himself that what the committee showed to the world on Saturday afternoon could be moot by Saturday night. In our estimation, it took just more than 24 hours to change. Virginia, which earned itself a No. 3 seed in the midseason reveal, lost at Virginia Tech on Sunday, opening the door to the first change among the top 16 seeds. We kept the Cavaliers out West, but flipped them with West Virginia, which started the weekend as the region’s No. 4 seed. The Mountaineers took care of business this week, beating Oklahoma on the road and Kansas State at home to move to 20–5 overall and 8–4 in the Big 12. No team is etched into its current spot in the field, but few teams have as wide a range of seeds as Virginia and West Virginia. The Cavaliers have a brutal remaining schedule, with one game apiece against Duke and Miami, and two against North Carolina, before the ACC tournament. The Mountaineers, meanwhile, still have return matchups with Kansas and Baylor, as well as meetings with Iowa State, TCU and Texas Tech on their regular season schedule. That gives both teams real opportunities to rise, or fall, in the field of 68.